Size of this preview: 800 × 588 pixels. Other resolutions: 320 × 235 pixels | 6,453 × 4,741 pixels. Description: "Le Sphynx apres les déblaiements et les deux grandes pyramides / Bonfils." 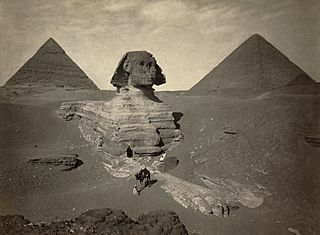 The Sphinx of Giza, partially excavated, with two pyramids in background. Albumen print. Credit: Library of Congress. Cf. Remembrances of the near east : the photographs of Bonfils, 1867-1906, curator Robert A. Sobieszek, Rochester : International Museum of Photography at George Eastman House; Cambridge : Harvard Semitic Museum, 1980 and The image of the East : nineteenth-century Near Eastern photographs by Bonfils : from the collections of the Harvard Semitic Museum, Carney E.S. Gavin; compiled and edited by Ingeborg Endter O'Reilly, Chicago : University of Chicago Press, 1982. Author: Maison Bonfils (Beirut, Lebanon), photographers : Félix (1831-1885), his wife, Lydie (1837-1918) and his son, Adrien (1861-1929). Most possible done by Félix. Permission: Cannot upload to Commons because the photographer's lifespan is unknown. This page was last modified on 20 April 2017, at 13:28.